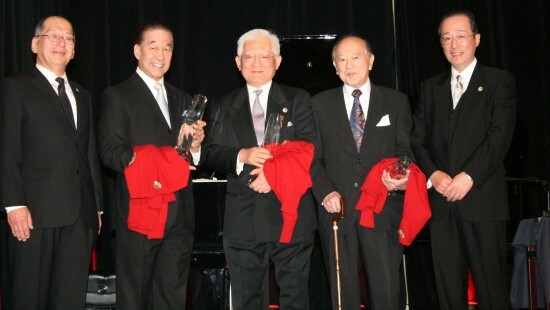 From left: Current JCCNC President Hiroshi Haruki, Steven G. Teraoka (president, 1994), Masaki Miki (president, 1992), Steven J. Doi (president, 1982), 60th Anniversary Committee Chairman Masanori Yasunaga. Haruki is president of Fujitsu Management Services of America; Teraoka is the managing partner of Teraoka & Partners LLP; Miki is a retired president of Kikkoman International Inc.; Doi is a semi-retired attorney formerly with Chan, Doi & Leal LLP; Yasunaga is president of Calbee America. SAN FRANCISCO — On Jan. 14, over 600 business persons gathered at the Westin St. Francis Hotel in San Francisco for the Japanese Chamber of Commerce of Northern California’s annual New Year’s celebration. The JCCNC celebrated its 60th anniversary and welcomed the Year of the Dragon. Highlighting the evening was an award presentation honoring three long-time JCCNC members who, over the course of their careers, made outstanding contributions to the organization. They received the JCCNC 60th Anniversary Outstanding Contribution Award. Steven G. Teraoka, managing partner of Teraoka & Partners LLP law firm, was a recipient of this coveted award, along with Masaki Miki, former president of Kikkoman International Inc., and Steven Doi, a retired prominent San Francisco attorney. Each of these individuals served as president of the JCCNC during their careers and made important longstanding contributions to their business community. The awards were presented by Masanori Yasunaga, president of Calbee America Inc., who is the 60th Anniversary Committee chairman, and by Hiroshi Haruki, president and CEO of Fujitsu Management Services of America Inc., who is current president of the JCCNC. Teraoka has practiced law for 38 years and counsels multinational Japan and European-based companies in U.S. domestic and international transactions. In 1994, he became the 53rd JCCNC president, the first Sansei to hold this post. He chaired the Committee to Welcome Their Majesties the Emperor and Empress of Japan for the 1994 royal visit to San Francisco and gave the welcoming address to the royal court. As a 35-year member of the chamber, Teraoka has served in various leadership capacities, including, community relations chairman, second vice president for multiple terms, and as government relations chairman for 15 years. He continues to play a vital role in government relations for the chamber. The longstanding attorney bar registry of Martindale-Hubbell recently acknowledged and commemorated Teraoka’s 25th anniversary as an AV-rated Preeminent Attorney. Miki served as JCCNC’s 50th president in 1992. He successfully guided JCCNC through a delicate period of U.S.-Japan relations, including a phase of Japan-bashing, by meeting with the mayors of San Francisco and San Jose, and state officials in Sacramento. During his tenure, he encouraged support by Japanese corporations for the San Francisco New Main Library. Miki is a true ambassador of JCCNC and continues to serve as a vital advisor on the Executive Committee. Doi is a retired partner from the San Francisco law firm Chan, Doi & Leal. He assisted Japanese companies doing business in the U.S., and has spent much of his life working to promote better relations and cultural understanding between the U.S. and Japan. He serves as director, Executive Committee member, and trustee of the Nippon Club Fund. Doi is the first Nisei elected as JCCNC president and is recognized as one of many pioneers of the organization’s early years. As the award was presented to Teraoka, he thanked the 60th Anniversary Committee, the president of the JCCNC and the Executive Committee for their kind consideration and for the award. He dedicated the award to his father and mother, George and Mary Teraoka of Fowler. He explained that his father, now 90 years of age, still provides guidance to him and has always taught that in any undertaking, one should think about helping other people, serving one’s community and serving the greater good. In this case, the greater good is U.S.-Japan relations. Teraoka then thanked the JCCNC for giving him an opportunity to contribute in some small way to the worthy cause of promoting U.S.-Japan relations. Miki, now retired, enjoys playing golf with the goal of matching his golf score with his age. Doi, also retired as an attorney, continues to be active in many community and nonprofit organizations. Teraoka continues to practice law and provides management leadership for his law firm’s expansion in San Francisco, Silicon Valley and Los Angeles. The New Year’s celebration was emceed by NBC Bay Area’s traffic anchor, Mike Inouye, who, along with the evening’s chairman, Masaki Yokai, handed out over 20 pricey door prizes, including three different Japan round-trip air packages donated by All Nippon Airways, Japan Airlines and Delta Airlines. The evening was further highlighted with a concert by world-class violinist Taro Hakase, who dazzled the crowd with his repertoire of renditions from his musical soundtrack of modern Japan.